Oil & gas aren't the only sought-after resources in canyon country. Potash, or potassium chloride, used as a fertilizer, is a mineral found in buried salt deposits throughout the region. Mining potash is a land-and water-intensive process whereby hot water is injected into deposits buried deep under ground. The potash dissolves into the water, which is then pumped to the surface and spread out into large, solar evaporation ponds. After the water has evaporated, the remaining minerals are scraped up by bulldozers. Visitors to Dead Horse Point State Park can look down on a large-scale potash mine that has been in operation since 1963. The area in which the mine operates, in full view from Utah's premier state park, was surreptitiously left out from the boundaries of Canyonlands National Park. The incongruity of the terraced evaporation ponds against the eroded red-rock landscape is impossible to ignore. The effect is heightened by the use of an ultramarine blue dye that hastens crystal growth and aids in evaporation. The BLM has issued new prospecting permits for approximately 75,000 acres within the proposed monument boundaries, and 9,000 acres are currently leased for development. Fifty years ago, President Lyndon B. Johnson signed legislation to protect a remote corner of Southeastern Utah. The wild and strangely beautiful landscape—the standing remnants of the erosional forces of the Green and Colorado rivers—is cut apart by deep canyons; faulted and warped by buried salt domes; and covered with rock spires, towers, buttes and mesas. The quest for the area to receive national park designation was fiercely contested by Utah politicians, many rural residents and those who represented mining, grazing and oil & gas interests. And when, on Sept. 12, 1964, it was all said and done and the area was officially designated as Canyonlands National Park, the final boundaries represented but a fraction of what the park's original visionary, Bates Wilson, had intended. Seemingly arbitrary lines had been drawn without regard for the landscape and its features. Seen on a map, the boundaries appear as severe right angles, in complete contrast with the sinuous curves of the landscape, the rivers, and especially the distant cliffs that define the Canyonlands Basin. Walt Dabney, superintendent of Canyonlands National Park from 1991 to 1999, says that the original proposal went from "rim to rim," which would have taken in the entire erosional basin from the Orange Cliffs on the west to their counterpart cliffs above Lockhart Basin to the east. "There is an assumption by visitors who stand at Grand View Point that they are looking at Canyonlands National Park," Dabney says. "But what they are actually looking at is an illogical and political compromise that resulted in only a part of the basin being protected." And today, with oil, gas and mineral development fast encroaching on the current boundaries, the land—63 percent of which is open to oil & gas development—is once again at the center of a political firestorm over how it should be managed, both for the sake of the land and its users, and for its highest economic benefit. A movement to expand the park to its original vision and beyond is gaining momentum, as a coalition of local, regional and national environmental groups—including the Sierra Club, the National Resource Defense Council and the Southern Utah Wilderness Alliance—have banded together as the Greater Canyonlands Coalition to lobby President Obama to designate 1.8 million acres as Greater Canyonlands National Monument. The coalition is joined by the Outdoor Industry Association and more than 100 outdoor businesses, signifying a new front in the fight to protect public lands—not only for their wilderness and scenic values, but also for their economic benefits. Outdoor recreation is big business in Utah, bringing in $6 billion to the state annually. In Moab, "Utah's Adventure Capital," outdoor recreation contributes more than $250 million a year to the local economy, and accounts for more than 40 percent of the jobs. In July, Headwaters Economics updated a study that found that national-monument designations were consistent with economic growth in adjacent communities, and that counties with more than 30 percent of their land base under federally protected status showed an increase in job rates at four times that of similar counties with no protected public lands. But the opposition to a monument is no less intense than it was 50 years ago. Some fear a monument will result in a loss of potential jobs and mineral royalties. Others are opposed on philosophical grounds. To them, the idea that a president can, by executive order, declare almost 2 million acres of land a national monument is the ultimate overreach of a heavy-handed federal government. San Juan County Commissioner Phil Lyman, made famous in May 2014 for his ATV protest ride in Recapture Canyon, says "the notion that the president would use his executive power" is an affront to all "freedom-loving people." An executive order, Lyman says, "circumvents the process. It ignores Congress, but more relevant to a county commissioner is that it ignores the county. These types of decisions are best made by locals." Lynn Jackson, county council chairman in neighboring Grand County— home to the town of Moab, Arches and Canyonlands National Park, and almost 1,700,000 acres of federally managed public lands—says it's possible to balance scenic and recreational values with resource extraction, and he is dead set against a monument. Speaking on his own behalf, Jackson, a geologist and former Bureau of Land Management supervisor, says he takes "issue with the ability of a small group of environmental activists who try to convince a president to use the authority of the 1906 Antiquities Act to set aside millions of acres of land with the stroke of a pen." But monument proponents maintain that public lands belong to all Americans—not just to those who live there, who may have a shortsighted vision for their management. Many believe that if state and local control prevailed, Utah's public lands would be sold off to the highest bidder regardless of their scenic, biological or recreational values. Bill Hedden, executive director of the Grand Canyon Trust, says state and local governments are ill equipped to manage federal lands. "While local elected officials have a valid voice in their management, they have no business trying to override the interests of the American people." Canyonlands has roughly 450,000 annual visitors, and about 60 percent of them visit the Island in the Sky district. The "Island" is a high, peninsular mesa perched above and between the twisting canyons of the Green and Colorado rivers. 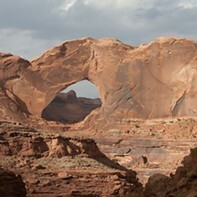 Visitors to the Island enter the park via Utah Scenic Byway 313, about nine miles north of Moab. The road heads west and immediately enters a canyon with low cliffs of rust-colored Wingate sandstone. Alcoves hollowed into the rock by wind and water contain evidence of early habitation by the Fremont and Desert Archaic people, and the walls are decorated with vivid rock art panels dating back 5,000 years or more. As the road climbs up out of the canyon through a pair of hairpin switchbacks, the view opens up on a grand scale. In the foreground, immediately to the north, are the towering and monolithic buttes of Monitor and Merrimack. To the east, the strangely eroded forms of Arches National Park give way to the undulating curve of the Uncompahgre Plateau, stretching all the way to Colorado. Slightly south, home to the Gemini Bridges jeep-and bike-trail complex, a plain dotted with pinyon pine and juniper faults upward to the Gold Bar Rim, beyond which the 13,000-feet-high peaks of the La Sal Mountains jut up from a jumbled maze of sandstone fins and incised canyons. To the west, one can see the entire length of the San Rafael Swell, the Henry Mountains, Factory Butte and, on a clear day, all the way to Boulder Mountain near Capitol Reef National Park. In the foreground, the sinuous canyons of the Green River begin to emerge as they wind their way toward the confluence with the Colorado River, the centerpiece of Canyonlands National Park. Until just a few years ago, the view was largely empty of manmade objects. Night skies were dark, and not a light could be seen in any direction, save the traffic on Interstate 70, 40 miles to the north. Now, towering drill rigs, lit up like Christmas trees, dot the landscape. Natural-gas flares light up the night sky, and well pads fitted with storage tanks and nodding horse-head pump jacks are appearing within sight of the park boundary. 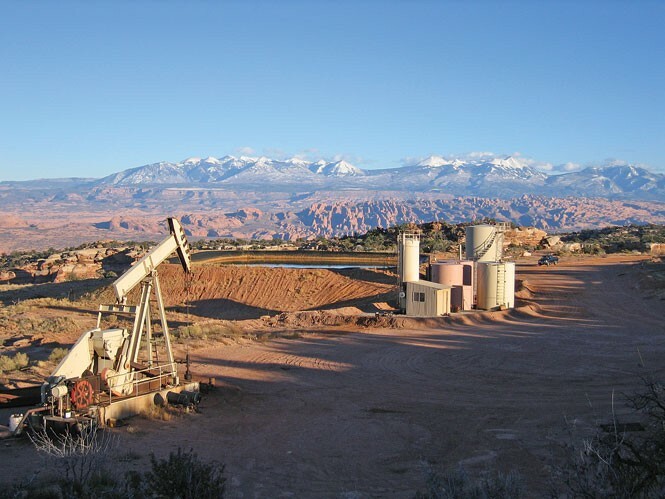 Mathew Gross, SUWA's campaign director for Greater Canyonlands, says this is just the first step toward transforming the Big Flat area into what local conservationists are now calling "Oil Land in the Sky." "This area is being transformed far more quickly than people realize, or that the oil & gas cheerleaders want to admit," Gross says. "The future of Greater Canyonlands without monument protection can already be seen if you drive up Highway 313 to the entrance of Dead Horse Point and Island in the Sky." Fidelity Exploration & Production has plans to develop 61,000 acres of land on Big Flat immediately adjacent to the border of Canyonlands and Dead Horse Point State Park. The oil & gas company currently has 23 wells in operation, with plans for up to 50 more. Fidelity spokesman Tim Rasmussen says the company uses the best management practices to limit impacts to the area's unique natural resources. "Fidelity plans to develop a fairly large area of land with minimal disturbance by permitting a very small number of discretely placed well pads," Rasmussen says. This equates to a disturbance footprint of approximately 0.4 percent, or 250 acres, of the entire developed area. Critics say that in spite of those numbers, the area will be transformed into an industrial zone, with a network of roads, drill pads and an above-ground pipeline. And Fidelity is just one company. When the BLM completes its Master Leasing Plan later this year, and more parcels come up for lease, there could be as many as 200 wells in the area. "People don't come from all over the world to see oil wells in the canyon country," says Moab resident Bill Love, who has been monitoring the development and raised numerous concerns about safety standards on a natural gas pipeline that is currently under construction. "The industrialization of the Big Flats area can be a significant loss to the tourist industry in Grand County over the life of the field," he says. "Each year, the tourist industry provides hundreds of millions of dollars of income to the economy of Grand County, while oil & gas development will only provide 2 to 5 million annually." In 2012, the Outdoor Industry Association sent a letter to Obama urging him to protect Greater Canyonlands on the grounds that "The future of our outdoor recreation economy depends on protecting iconic landscapes such as Greater Canyonlands. And monument proclamation is an important and effective way to provide the protection that is needed." The letter also says, "Greater Canyonlands is endangered. Federal land-use plans inappropriately open scenic and undeveloped land to drilling and mining and fail to address exploding off-road vehicle use that is damaging riparian areas, cultural sites, soils and solitude." Jackson says he respects those who believe the area is being turned into an industrial zone, but he doesn't share that opinion. He is taking the long view, he says, and doesn't believe oil & gas development will affect tourism. "These wells and this field will be developed and reclaimed over a few decades and the lands will remain," he says. "My goal is to continue to find ways to accommodate all uses in the area." He says the field will provide significant revenue to the county, and that it is a relatively small development that will have minimal impact on the landscape. "Big fields in other parts of the country often have between 500 to 5,000 wells," Jackson said. "So on a relative scale, this field, at full development, is several orders of magnitude smaller." It is estimated that Big Flat oil field will produce about 30 million barrels of oil over the next 30 years. Proponents say it will also bring higher paying jobs to the area, but Love says that oil companies bring in their own crews, and that the overall amount of oil produced will be insignificant on a national scale. According to statistics from the U.S. Energy Information Administration, the United States consumed 18.8 million barrels a day in 2013—in other words, 30 million barrels of oil are just a drop in the bucket.